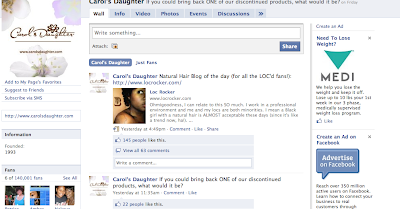 Loc Rocker: LocRocker featured on Carol's Daughter FB page! LocRocker featured on Carol's Daughter FB page! Awww, what a nice little surprise. LocRocker was featured Carol's Daughter's FB page as their "Blog of the Day". Quite the honor! I received a ton of tweets, emails and FB messages about it so I appreciate it, y'all. Someone even suggested that I start a LocRocker.com FB page. Er uhh....do I have to? LOL! Clumps of Mascara has one here and I'm hardly super active on that. I'll think about it though. There is a way to add me as a friend on Facebook but you'll have to email me your name because I am sooo un-searchable. Welcome new visitors! Love y'all and tomorrow I'll be talking about this nasty stuff called dandruff. Yeah, go 'head and brace ya self. Congrats :o) I think you should make a fan page as well. You should indeed make a fan page. But WOO HOO for this! YESSSSS B! Amazing girl! I'm so proud of you.